Microsoft removed the sign-up requirement for the use of the Skype Translator Preview yesterday. Now all users need to give the service a try is Windows 8.1 or Windows 10 on a PC or tablet. The app currently supports four spoken languages and fifty typed languages. 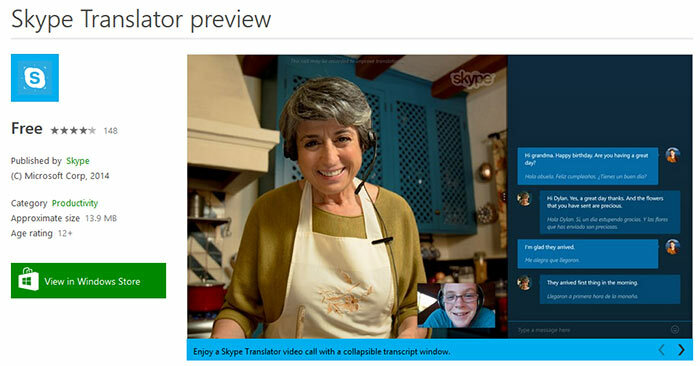 Microsoft hopes that it is breaking down language barriers by making access to the Skype Translator Preview easier. The application can now be downloaded by anyone with access to the Windows Store (via Windows 8.1 or Windows 10 preview) on a PC or tablet. Previously it was restricted to those who signed up to a waiting list. Skype Translator's current capabilities include the translation of English, Spanish, Italian and Mandarin speech in "near real-time". As you and your friend speak you also get to see an on screen transcript of your call. The Skype Translator Preview opened up to invitees in December last year and has been met with favourable feedback says Microsoft. It highlights the work of a non-profit development organization based in New York City dedicated to providing women in Latin America with vital financial, health, and human development services. The translation app has been of great value to both the people working at the organisation and their clients. As the app matures, with the help of feedback from users old and new, Microsoft hopes to enable the translation of "as many languages as possible on relevant platforms," for up to as many as 300 million current Skype customers. Well, this could be extremely useful IF it works well, and accurately. But given the atrocious mangling most text translators come up with, I wouldn't trust it (yet) for business calls where misunderstanding could get very awkward, and expensive. As you and your friend speak you also get to see an on screen transcript of your call. …. I wonder how many people have “friends” they don't share a common language with, at least at a rudimentary level. I guess it's possible, but I suspect, not common. This will be a fantastic advance IF it works accurately, resulting in a proper translation. But the standard of text translators makes me think it'll be a while, probably years, before we get there.